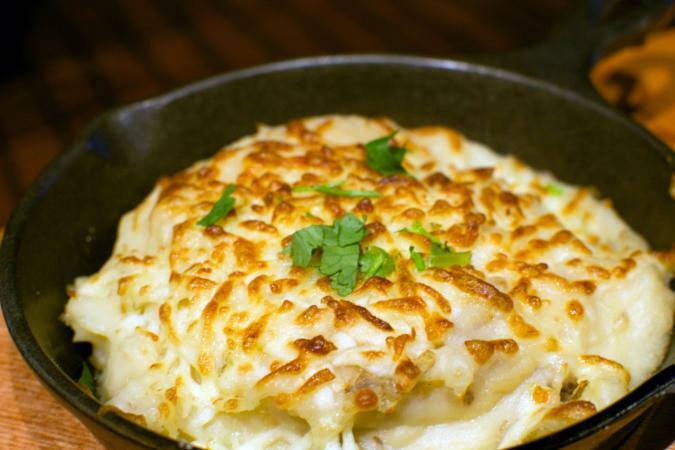 The word "loaded" doesn't always have a good connotation but when it comes to mashed potatoes, ho boy, that means you're in for something special. If you have all your add-ins ready by the time the potatoes are mashed, the rest is gravy. Ooh, good gravy, that's a thought! 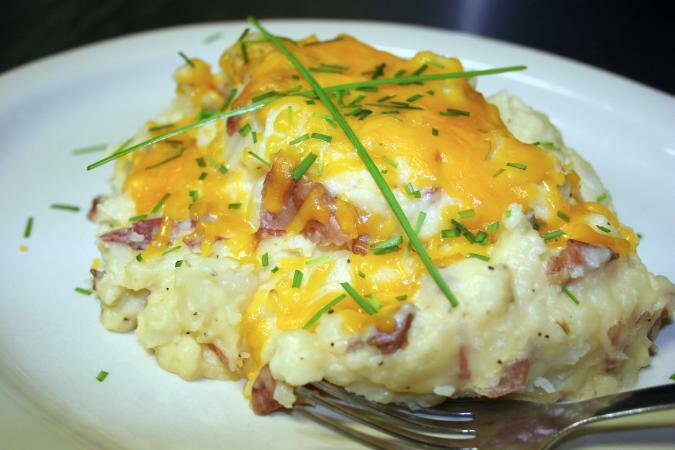 This basic loaded mashed potatoes recipe can be doubled with good results. Mashing potatoes with an electric mixer or in a food processor is not recommended because you could end up with a gluey mess. It's best to mash by hand, in a food mill, or with a ricer. Place prepared potatoes in a large saucepan with enough salted water to cover. Bring to a boil. Reduce heat and simmer uncovered for 10 to 15 minutes or until tender. Drain potatoes and return to saucepan. Mash by hand or run through a food mill or ricer until smooth. Add salt and pepper to taste, butter, and sour cream, mixing by hand. Reserve 1/4 cup of the grated cheese and bacon bits for garnish. Mix the rest in with the potatoes by hand. Adjust the seasonings if necessary. Serve immediately in a large bowl with reserved grated cheese and bacon bits sprinkled on top for garnish if desired. Loaded potatoes go well with steak, roasted meats, hamburgers, and a green salad or non-starchy vegetable like asparagus or green beans. This basic recipe lends itself to so many variations. Consider adding any or all of the following ingredients for a change of pace. Turn the dish into a casserole by following these steps. Prepare your favorite version of loaded mashed potatoes, and pat it into a cooking-spray-coated 13x9-inch ovenproof pan or oven-proof skillet. If you plan to store the dish before baking, cover it tightly with aluminum foil and refrigerate (or freeze for longer storage). Bake in a 350 F oven for about 1 hour if it's straight out of the refrigerator, 45 minutes if at room temperature and 90 minutes or longer if frozen. Remove the foil about 20 minutes before the cooking time is up and sprinkle additional grated cheese on top if desired. Remove from oven when bubbly or heated through and serve immediately. When selecting potatoes for your recipe, you want to go with starchy potatoes, like good old russets rather than waxy or new potatoes. Waxy potatoes have a high moisture content, a high sugar content, and a low starch content. They are best for boiling whole, or in salads and soups, for hashed browns, or anytime you want a potato to hold its shape. Starchy potatoes like russets are low in moisture and sugar and have a high starch content. They become light, dry, and mealy when they are cooked. They make superior mashed potatoes. Loaded mashed potatoes are great anytime but they are a real lifesaver when it comes to the holidays, a party, or whenever time is an issue, because they can be made in advance, frozen, and reheated when the need arises without any loss in flavor. They also hold well on a buffet line.